Two of my all-time breakfast foods come together to make one yummy and filling breakfast. We had our first major snow storm yesterday. Yeah, we had a little over twelve inches of snow. They had been forecasting for a few days before it came. I am a worry wart, so, to say the least, I was a little worried about the whole snow storm broadcast. Yeah, Mike was out of town for work. Plus we live out in the country with a very long driveway and the roads to our house are not plowed too often. But I am happy to say that I made it through the storm and I made it home from work and back to work this morning. Although I did get stuck in the driveway… but after snow blowing and shoveling I was able to drive the car into the garage for the night. This is the kind of weather when I love such comfort foods as oatmeal and pancakes for breakfast. When I decided to combine the two together I was not quite sure what to expect. They turned out to be a hearty delicious pancake. This is the kind of breakfast that sticks with you throughout the morning. Apple is another thing that I enjoy eating for breakfast. You know what they say an apple a day keeps the doctor away. 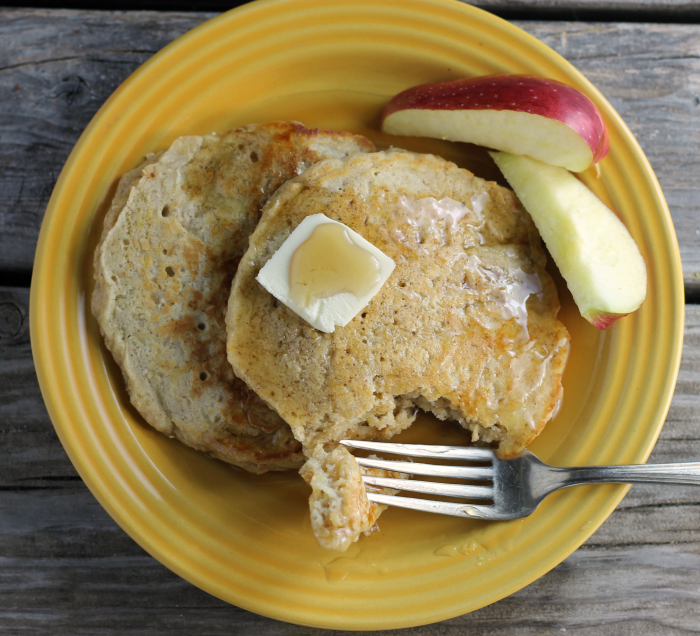 Apple oatmeal pancakes are just as simple to make as other pancakes. I shredded the apples so that they would be cooked through, I didn’t want to have bits of raw apple in the pancakes. Also, I cooked these apple oatmeal pancakes at a slightly lower temperature, also to help the apple along. 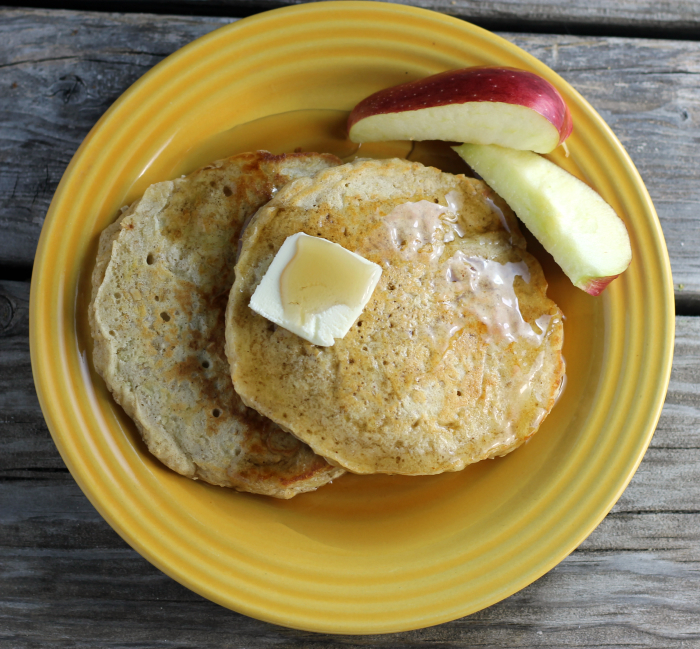 So you are looking for a yummy breakfast that is sure to fill you up on and stay with you I would suggest trying some apple oatmeal pancakes. Combine the dry ingredients and mix together. In another bowl add the wet ingredients along with the shredded apple and mix together. Add the wet ingredients to the dry ingredients and mix just until combined. The mixture will still be a bit lumpy. Heat a griddle or a skillet over medium-low heat. Add the butter to the griddle or skillet and make coat the frying area. Pour about a 1/3 cup of the batter onto the prepared griddle. Cook until the top of the pancake bubbles and the underside is lightly browned about 3 minutes. Turn over and continue to fry until the underside is browned. Making sure that the center of the pancake is cooked through. Serve immediately with your favorite syrup. I’m glad you made it through, I would’ve been really scared, snow storm is something new to me and can’t get used to it! We had about 10 inches of snow so it triggered comfort food for me, like chili. Gary makes an oatmeal pancake like this. As a matter of fact he will be making them next week for a fund raiser. Thanks for stopping by Carol. I will have to get Gary’s oatmeal pancake recipe from you. Glad you made it through the snow OK! The storm just missed us. We haven’t had any yet this year and I’m kind of sad about it. But these pancakes make me happy! I love the combo of oats, cinnamon and apples – such great flavors. Wow, 12″ is a serious storm! Glad you made it through. We have yet to get much snow this year (I think we’re around 3″ total)…and I’m actually starting to miss the white stuff. (I never thought I would say that!) 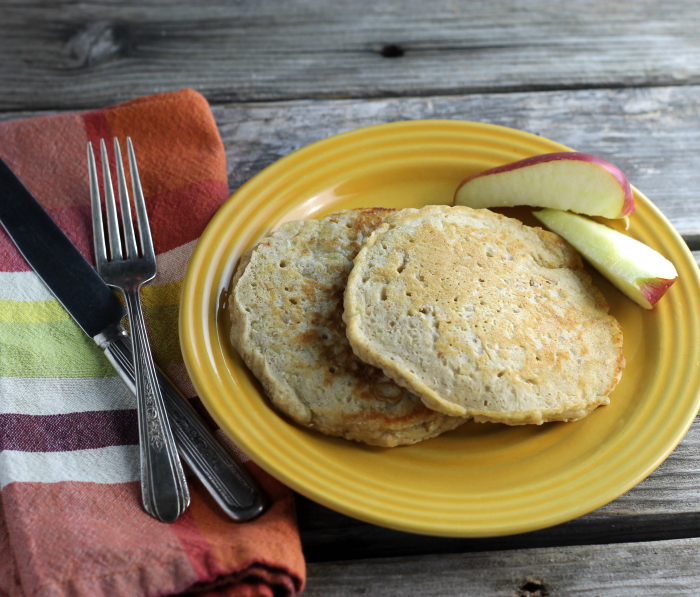 I can also almost smell these apple pancakes. 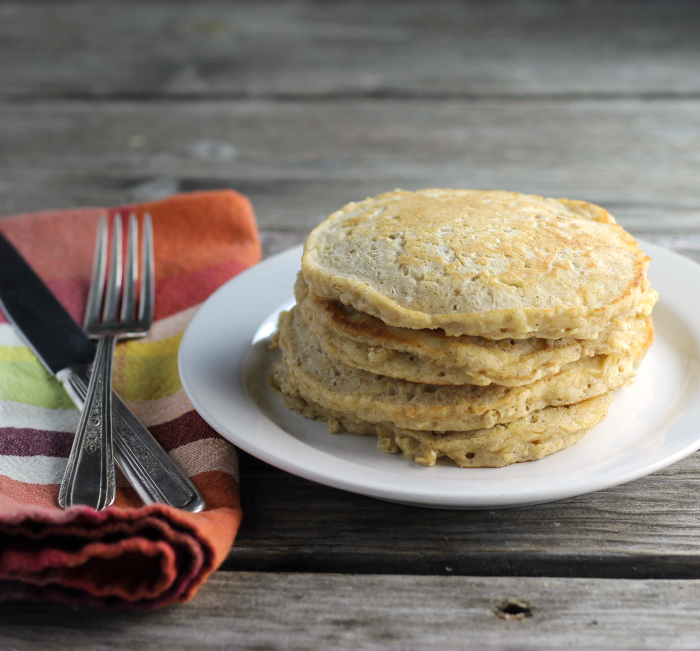 They’re perfect for a cold, weekend morning…and I might need to whip up a batch soon! Glad that you made it through the snow storm!! 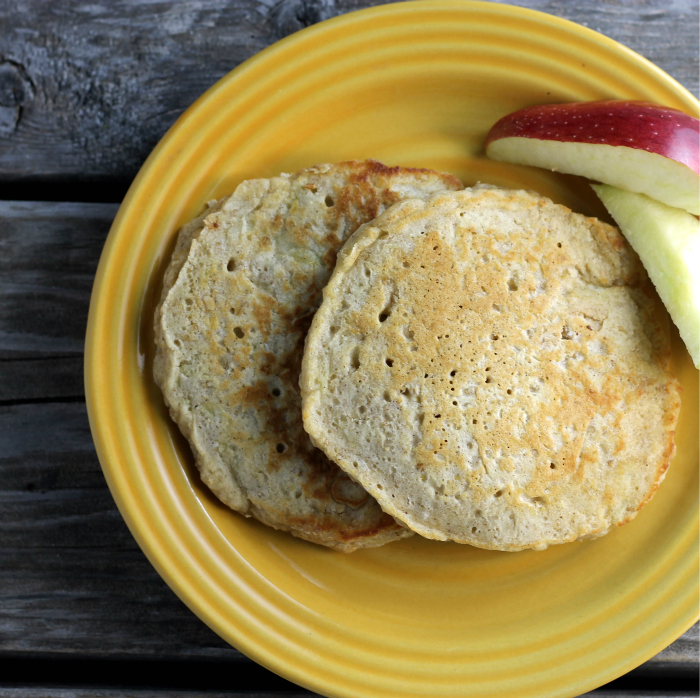 These pancakes look so delicious…a perfect breakfast! looks so delicious, Dawn! I’m following a gluten free diet – so I use a lot of oats (and can use gluten free flour instead of wheat) … I look forward of trying your recipe!